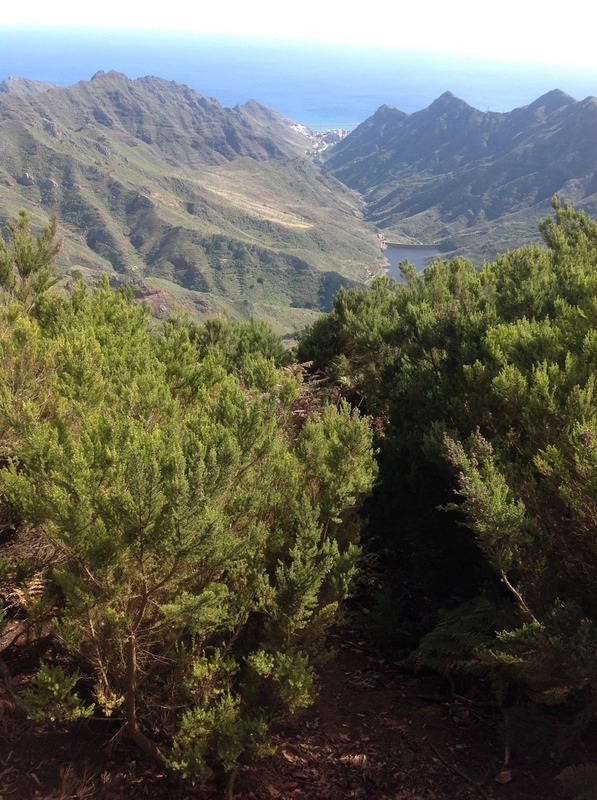 If there is a more beautiful place than the Parque Rural de Anaga, I have not been there. That, more or less, is what I kept repeating to myself as I drove and walked across its landscapes. I tried my best to take a few pictures with a dying phone and an old iPad, but it was such a sensory experience and delight that I feel like I need to write this down, in part so can share it and in part so I can remember it. The T12 climbs up from the sea along the rising rim of a wide valley. Though the road is terrifying, you marvel at the scenery around you. Giant volcanic crags rise from the ridges, their sides pocked with caves made by the now-gone. (1) The land is covered in low shrubs and a strange kind of cactus, like a chandelier of cactus branches emerging from a single stem. As you twist and turn, instinctually sucking in your stomache for passing cars, you alternate between facing straight up the mountain and straight down to the sea. The spine tingling moment comes as you reach the crest of the mountain, where the laurisilva begins. Where the sea winds blow into the mountains, this lush community of plants wrings the water out of the clouds. At one point, I stood on the peak of a ridge in a blackberry bramble, staring down the cactus-chandeliered mountain all the way down to the sea. In the space between my back and my front, I could feel the dry, warm air of the south slope mix with the cool, wet air of the north slope. Being in the laurisilva is an experience of total immersion. The park actually plays with this dynamic, and has set up a trail with markers asking you to stand and smell, look, touch, or listen to the world around you. It sounds goofy, but totally works. The forest is relatively low, made up of gnarled and twisting trees with trailing vines and mosses. It is contantly raining, just a little, from the end of every tendril, leaf, and breanch. Unknown birds titter in the trees, almost always unseen. Thanks to days spent in the woods with my grandfather, I know almost every tree that I see. A few have been added to the list over the years, like sassafrass and tamarack, but I nearly always know more or less waht I am seeing. The same goes for birds, his other passion. It is so humbling to stand in a place where you know nothing, to see birds you can only describe in terms of other things: chickadee-goldfinches flit through a nearby bush. Even the things you have a reference for are strange. Wild canaries, less colorful and more wild looking than their caged cousins. Heather growing like Florida cedar trees, with smooth reddish bark and nearly spiraled branches. The thing that cannot be conveyed is the smell. There is damp, and earth, of course. But it smells like the essence of clean, growing things, like if you breathed in long enough you could live as long as the trees. It constantly shifts: resiny, spicy, sweet, wet, depending on where you are and the direction of the breeze. Though it feels so primordial and ancient, you can stand at the border between old growth and new and see the transition between the twisting heather and the statelier trees with glossy green leaves. It fells riotous with life, with birds and ants and plants and snails. The fairy forest slopes halfway hown the mountain to Taganana, where you come into the Mediterranean, or so it seems. Grapes grow on terraces and villages nestle on steep hills. Again, you are in a valley running to the sea, where there are great boulders and columns and misty black sand beaches. Even as the weather shifts from bright open skies to that misty yellow Irish sunshine, the water is warm enough to swim in. Surfers bob along the point break of the boulders, while people in their trunks and bikini bottoms bodysurf. I didn't have a towel to separate the black sand and seawater from my rental car, but I so badly wanted to join them. (1) They are gone in the sense they are no longer a distinct group. From the best anyone can tell, they are the partial ancestors of many Canarians. They were descended from North African groups, though, so their mestizo descendents would be hard to tell apart from (the average Spaniard. I'm actually here to start a dissertation chapter on their conquest, which is a topic of deep interest here, but not so much to the wider Latin American field.